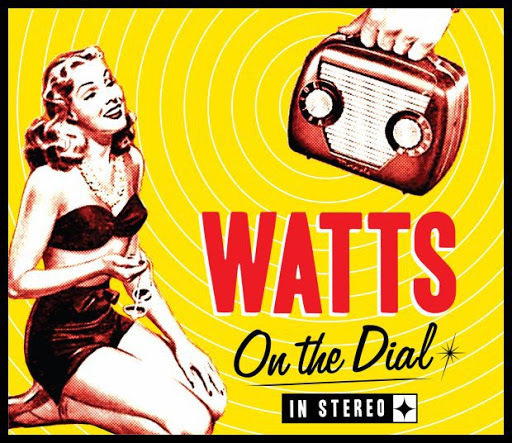 Song of the day: Watts – "On The Dial"
The album is called On The Dial – but you probably figured that out already if you saw the picture of the album cover at the top of this post. Watts “make a superb retro rock ‘n’ roll racket” says Rob Forbes (Leicester Bangs). people saying “daddy-o” and “neat” and “zoot suit” etc. A part of me then imagined that Watts, when playing live, and in much the same way that The Ramones started every song with “1-2-3-4!”, might start every one of their songs with “One, two, three o’clock, four o’clock rock…”. A dynamic four-piece aptly named for the gentlemen drummer of the Rolling Stones. Watts’ sound combines all the best elements of 70’s glam, old school punk, new wave, British Invasion and straight up rock-n-roll to create a timeless amalgam that is at once familiar and fresh. Okey dokey, then. They’re not a 50’s revivalist band – they’re a 70’s revivalist band. I can dig it. Before we get to the music, I’d like to comment on one aspect of the album’s artwork. On the front cover it proudly proclaims that it’s “In Stereo”. I like that. I’ve now listened to the album a few times, and I can say that it is indeed a 70’s-ish rock album, the kind you’ll like if you like early-70’s Rolling Stones, early-70’s Humble Pie, early-70’s Faces et al. Or, putting it another way: if you like music by sweaty, hairy rockers then Watts is possibly the band for you. I’d say that their music could be seen as being in the general vicinity of The Black Crowes, but without the irritation factor. This is a solid rock song, well-played. Can’t argue with that. This is a solid rock song, too. Another solid rock song. I’m beginning to see a pattern forming here. More solid rock. Of the first four songs, this was my favourite. Incidentally, it’s the first song on the album not sung by lead vocalist Dan Kopko. I hope that doesn’t imply that I think Dan’s a dreadful singer and will only listen to Watts if Dan’s not singing. I think Dan is a fine, raspy, rock singer. His voice is well suited to the music. But so is the voice on this track, which belongs to the band’s drummer, Johnny “Rock” Lynch. But no matter who’s singing on these tracks, there’s some decent singing on this album. I like how the band starts a song about girls on holiday by quoting the main riff in girl group The Crystals’ “Then He Kissed Me”. I thought that was a nice touch. Unless it was unintentional. If that riff-nicking was unintentional, then I’ll say that was a nice subconscious touch. I can’t think of anything spectacularly insightful or witty to say about this one other than it’s… um… er… it’s a solid rock song. I can say that this is probably the most Stones-y song on the album. How much you like Sticky Fingers will determine how often you’ll play this track. I was pleasantly surprised to see this song here. This is a cover version of a song by The Angels, a 70’s pub rock band from Adelaide (in South Australia – where I live). “No Secrets” was a big hit in Australia in 1980. This version by Watts is, I’m relieved to say, is not too bad. Watts’ version is pretty close to the original, so it’s not startingly different in any particular way. (I guess they like playing the song “as is”, so to speak, instead of feeling the need to “reinterpret” it to fit their “vision” of how they think it “should” have sounded in the first place – and anything else that requires quotation marks.) Actually, it’s so similar to the original that Watts’ lead singer Dan “I like The Angels” Kopko even whispers “Won’t you please tell me what the time is?” at the end of the song. The Angels’ lead singer Doc Neeson whispered “Can you please me what the time is?” at the end of the original. And the main guitar solo is identical to the original. The only thing I miss from Watts’ version is the twin-guitar attack (à la Thin Lizzy) in the original. A slightly slower solid rock song. Being slightly slower, I guess this one could be called “mid-tempo”. (There I go with the quotation marks again. Sorry about that.) But whatever it’s called, I like it. It has a drone in it. I love drones. By the way, this is another song not sung by Dan “Why do I bother showing up at gigs?” Kopko. This one’s sung by the band’s bass player, Craig Lapointe. Maybe this is an Equal Opportunities band. Yep. It’s a solid rock song. I have a feeling they’re not singing about an old, old British newspaper. Nope, they’re not singing about The Times, they’re singing about something being “a sign of the times”. Exactly what that something is I couldn’t tell you, mainly because I wasn’t paying that much attention to the lyrics. However, one lyric I did notice was when they sang “I can’t drink it out of my mind” (at 1:50), paraphrasing The Rolling Stones. If you’re familiar with The Rolling Stones (I dare say you are), you’d recognise a similar phrase in a fairly well-known Stones song. I like the pun. (Byrds fans will know.) Which prompts me to ask the question: why didn’t anyone think of that pun before now? Despite that potentially unanswerable question, this song is par for the course. In other words, it’s another solid rock song. But I reckon you were way ahead of me there. having all the songs here may discourage you from buying the album in case you were interested in it – and I wouldn’t want a Watts Lynch Mob™ coming after me. you want to be at least a little surprised when you hear a new album, don’t you? You are currently browsing the archives for the Watts category.